ユーザーが組織のリソースに接続するシナリオはますます複雑になっています。People are connecting to organizational resources in increasingly complicated scenarios. ユーザーは、スマート フォン、タブレット、PC、ラップトップを使用し、多くの場合は複数のプラットフォームで、会社のネットワーク内またはネットワーク外にある、組織所有デバイス、個人デバイス、パブリック デバイスから接続します。People connect from organization-owned, personal, and public devices on and off the corporate network using smart phones, tablets, PCs, and laptops, often on multiple platforms. このような常時接続でマルチ デバイスおよびマルチ プラットフォームの世界では、ユーザー アカウントのセキュリティがますます重要になります。In this always-connected, multi-device and multi-platform world, the security of user accounts is more important than ever. デバイス、ネットワーク、プラットフォームで共通して使用されるパスワードは、その複雑さに関係なく、ユーザー アカウントのセキュリティを確保するのにもはや十分ではありません。ユーザーが複数のアカウントでパスワードを再利用する傾向がある場合は特にそうです。Passwords, no matter their complexity, used across devices, networks, and platforms are no longer sufficient to ensure the security of the user account, especially when users tend to reuse passwords across accounts. 高度になったフィッシングやその他のソーシャル エンジニア リング攻撃により、ユーザー名とパスワードが悪質な Web で投稿されたり販売されたりする可能性があります。Sophisticated phishing and other social engineering attacks can result in usernames and passwords being posted and sold across the dark web. Azure Multi-Factor Authentication (MFA) は、データやアプリケーションへのアクセスを保護するのに役立ちます。Azure Multi-Factor Authentication (MFA) helps safeguard access to data and applications. 第 2 の形式の認証を使用して、セキュリティのレイヤーが追加されます。It provides an additional layer of security using a second form of authentication. 組織では、条件付きアクセスを使用して、固有のニーズにソリューションを合わせることができます。Organizations can use conditional access to make the solution fit their specific needs. 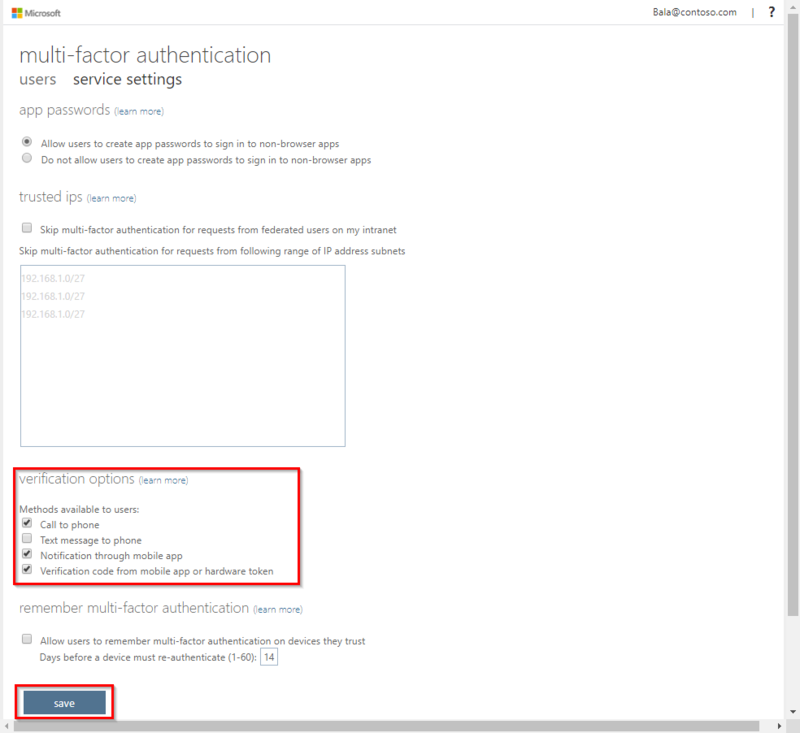 Azure Multi-factor Authentication のデプロイを始める前に考慮すべき前提条件があります。Before starting a deployment of Azure Multi-Factor Authentication, there are prerequisite items that should be considered. ハイブリッド ID のシナリオHybrid identity scenarios Azure AD Connect がデプロイされ、ユーザー ID はオンプレミスの Active Directory Domain Services および Azure Active Directory と同期またはフェデレーションされています。Azure AD Connect is deployed and user identities are synchronized or federated with the on-premises Active Directory Domain Services with Azure Active Directory. クラウド アクセス用に公開されたオンプレミスのレガシ アプリケーションOn-premises legacy applications published for cloud access Azure AD のアプリケーション プロキシがデプロイされています。Azure AD Application Proxy is deployed. Azure MFA と RADIUS 認証の使用Using Azure MFA with RADIUS Authentication ネットワーク ポリシー サーバー (NPS) がデプロイされています。A Network Policy Server (NPS) is deployed. ユーザーが Microsoft Office 2010 以前または Apple Mail for iOS 11 以前を使用しているUsers have Microsoft Office 2010 or earlier, or Apple Mail for iOS 11 or earlier Microsoft Office 2013 以降および Apple mail for iOS 12 以降にアップグレードします。Upgrade to Microsoft Office 2013 or later and Apple mail for iOS 12 or later. 従来の認証プロトコルでは、条件付きアクセスはサポートされていません。Conditional access is not supported by legacy authentication protocols. MFA のロールアウト計画には、パイロット デプロイと、それに続くサポート キャパシティ内でのデプロイ ウェーブが含まれる必要があります。Your MFA rollout plan should include a pilot deployment followed by deployment waves that are within your support capacity. 小規模なグループまたはパイロット ユーザーに条件付きアクセス ポリシーを適用することで、ロールアウトを開始します。Begin your rollout by applying your conditional access policies to a small group of pilot users. パイロット ユーザー、使用されたプロセス、および登録動作への影響を評価した後、ポリシーにグループを追加するか、既存のグループにユーザーを追加することができます。After evaluating the effect on the pilot users, process used, and registration behaviors, you can either add more groups to the policy or add more users to the existing groups. 今後の変更、Azure MFA の登録要件、必要なユーザー アクションについて、計画的にユーザーに通知することが重要です。It is critical to inform users, in planned communications, about upcoming changes, Azure MFA registration requirements, and any necessary user actions. 通信部門、変更管理部門、人事部門など、組織内の代表者と連携して、伝達方法を用意することをお勧めします。We recommend communications are developed in concert with representatives from within your organization, such as a Communications, Change Management, or Human Resources departments. Microsoft では、伝達方法の原案として役立つ通信テンプレートとエンドユーザー文書が用意されています。Microsoft provides communication templates and end-user documentation to help draft your communications. ユーザーに https://myprofile.microsoft.com にアクセスさせ、そのページの [セキュリティ情報] リンクを選択して直接登録させることができます。You can send users to https://myprofile.microsoft.com to register directly by selecting the Security Info links on that page. 条件付きアクセス ポリシーでは登録が強制され、未登録ユーザーには最初のサインイン時に登録を完了することが要求されます。これは、セキュリティ上の重要な考慮事項です。Conditional access policies enforce registration, requiring unregistered users to complete registration at first sign-in, an important security consideration. Azure Active Directory Identity Protection によって検出されるリスク イベントには、リアルタイムで発生するものや、オフライン処理が必要なものがあります。Some of the risk events detected by Azure Active Directory Identity Protection occur in real time and some require offline processing. 管理者は、リスクのある動作を示すユーザーをブロックして手動で修復する、パスワードの変更を要求する、または条件付きアクセス ポリシーの一部として多要素認証を要求することを選択できます。Administrators can choose to block users who exhibit risky behaviors and remediate manually, require a password change, or require a multi-factor authentication as part of their conditional access policies. 組織では条件付きアクセスを使用し、名前付きの場所を使用してネットワークを定義することをお勧めしました。We recommended that organizations use conditional access to define their network using named locations. 組織で Identity Protection を使用している場合は、名前付きの場所ではなく、リスクベースのポリシーを使用することを検討します。If your organization is using Identity Protection, consider using risk-based policies instead of named locations. 場所を信頼済みとしてマークするかどうかを決定します。Decide whether to mark the location as Trusted. 信頼できる場所からサインインすることで、ユーザーのサインイン リスクが低下します。Signing in from a trusted location lowers a user's sign-in risk. 入力した IP 範囲が確立され、組織内で信用されていることがわかる場合のみ、この場所を信頼できる場所とマークしてください。Only mark this location as trusted if you know the IP ranges entered are established and credible in your organization. ドロップダウン メニューを開き、この名前付きの場所に対して定義する国または地域を選択します。Expand the drop-down menu and select the countries or regions you wish to define for this named location. 不明な領域を含めるかどうかを決定します。Decide whether to Include unknown areas. 不明な領域は、国/地域にマップできない IP アドレスです。Unknown areas are IP addresses that can't be mapped to a country/region. モバイル デバイスの Microsoft Authenticator アプリに、プッシュ通知が送信されます。A push notification is sent to the Microsoft Authenticator app on your mobile device. ユーザーは通知を表示し、[承認] を選択して認証を完了します。The user views the notification and selects Approve to complete verification. モバイル アプリによるプッシュ通知では、ユーザーへの影響が最も少ないオプションが提供されます。Push notifications through a mobile app provide the least intrusive option for users. テレフォニーではなくデータ接続を使用するため、最も信頼性が高くて安全なオプションでもあります。They are also the most reliable and secure option because they use a data connection rather than telephony. 組織に中国勤務のスタッフや中国に出張中のスタッフがいる場合、Android デバイスでのモバイル アプリによる通知メソッドはその国では機能しません。If your organization has staff working in or traveling to China, the Notification through mobile app method on Android devices does not work in that country. それらのユーザーには別の方法を使用できるようにする必要があります。Alternate methods should be made available for those users. Microsoft Authenticator アプリなどのモバイル アプリで、30 秒ごとに新しい OATH 確認コードが生成されます。A mobile app like the Microsoft Authenticator app generates a new OATH verification code every 30 seconds. ユーザーは確認コードをサインイン インターフェイスに入力します。The user enters the verification code into the sign-in interface. モバイル アプリのオプションは、スマート フォンがデータ信号でも携帯ネットワーク信号でも使用できます。The mobile app option can be used whether or not the phone has a data or cellular signal. ユーザーに自動音声通話を行います。An automated voice call is placed to the user. ユーザーは、呼び出しに応答し、電話のキーパッドの # を押して認証を承認します。The user answers the call and presses # on the phone keypad to approve their authentication. 電話の呼び出しは、モバイル アプリからの通知または確認コードに対する優れたバックアップ方法です。Call to phone is a great backup method for notification or verification code from a mobile app. 確認コードを含むテキスト メッセージがユーザーに送信され、ユーザーは確認コードをサインイン インターフェイスに入力するよう求められます。A text message that contains a verification code is sent to the user, the user is prompted to enter the verification code into the sign-in interface. [Azure Active Directory]、[ユーザー]、[Multi-Factor Authentication] に移動します。Browse to Azure Active Directory, Users, Multi-Factor Authentication. 開いた新しいタブで、[サービスの設定] に移動します。In the new tab that opens browse to service settings. [検証オプション] で、ユーザーが使用できる方法のすべてのボックスをオンにします。Under verification options, check all of the boxes for methods available to users. [サービスの設定] タブを閉じます。Close the service settings tab. 管理者は、ユーザーが方法を登録する方法を決定する必要があります。Administrators must determine how users will register their methods. 組織では、Azure MFA とパスワード リセットのセルフサービス (SSPR) に対する新しい組み合わせの登録エクスペリエンスを有効にする必要があります。Organizations should enable the new combined registration experience for Azure MFA and self-service password reset (SSPR). SSPR では、ユーザーは、多要素認証に使用するのと同じ方法を使用して、セキュリティで保護された方法でパスワードをリセットすることができます。SSPR allows users to reset their password in a secure way using the same methods they use for multi-factor authentication. 両方のサービスに 1 回で登録できるユーザーにとって優れたエクスペリエンスであるため、この組み合わせ登録 (現在パブリック プレビュー中) をお勧めします。We recommend this combined registration, currently in public preview, because it’s a great experience for users, with the ability to register once for both services. SSPR と Azure MFA に対して同じ方法を有効にすると、ユーザーは両方の機能を使用するよう登録できます。Enabling the same methods for SSPR and Azure MFA will allow your users to be registered to use both features. 組織が Azure Active Directory Identity Protection を使用して場合は、ユーザーが対話形式で次にサインインするときに登録を求めるよう、MFA 登録ポリシーを構成します。If your organization is using Azure Active Directory Identity Protection, configure the MFA registration policy to prompt your users to register the next time they sign in interactively. 組織が Identity Protection を有効にするライセンスを持っていない場合は、ユーザーは、次に MFA を必要とするサインインを行うときに、登録を求められます。If your organization does not have licenses that enable Identity Protection, users are prompted to register the next time that MFA is required at sign-in. MFA で保護されたアプリケーションを使用していないユーザーは、MFA に登録されない可能性があります。Users may not be registered for MFA if they don't use applications protected with MFA. 悪意のあるユーザーがユーザーのパスワードを推測し、ユーザーに代わって MFA に登録して、効果的にアカウントを制御できるようになるのを防ぐため、すべてのユーザーに登録させることが重要です。It's important to get all users registered so that bad actors cannot guess the password of a user and register for MFA on their behalf, effectively taking control of the account. グループを作成し、現在登録されていないすべてのユーザーを追加します。Create a group, add all users not currently registered. 条件付きアクセスを使用して、このグループに対しすべてのリソースへのアクセスに多要素認証を強制します。Using conditional access, enforce multi-factor authentication for this group for access to all resources. 定期的に、グループのメンバーシップを再評価し、登録の済んだユーザーをグループから削除します。Periodically, reevaluate the group membership, and remove users who have registered from the group. MSOnline PowerShell モジュールに依存する PowerShell コマンドを使用して、登録済みと未登録の Azure MFA ユーザーを識別できます。You may identify registered and non-registered Azure MFA users with PowerShell commands that rely on the MSOnline PowerShell module. どのようなときに MFA および他のコントロールが必要かを決定する条件付きアクセス ポリシーの戦略を計画するには、「Azure Active Directory の条件付きアクセスとは」をご覧ください。To plan your conditional access policy strategy, which will determine when MFA and other controls are required, refer to What is conditional access in Azure Active Directory?. 誤って自分が Azure AD テナントからロックアウトされないようにすることが重要です。It is important that you prevent being inadvertently locked out of your Azure AD tenant. テナントに複数の緊急アクセス用アカウントを作成し、条件付きアクセス ポリシーからそれらを除外することによって、不注意で管理アクセスが不可能になることによる影響を軽減できます。You can mitigate the impact of this inadvertent lack of administrative access by creating two or more emergency access accounts in your tenant and excluding them from your conditional access policy. グローバル管理者アカウントを使用して Azure portal にサインインします。Sign in to the Azure portal using a global administrator account. [Azure Active Directory]、[条件付きアクセス] の順に移動しますBrowse to Azure Active Directory, Conditional Access. ポリシーのわかりやすい名前を指定します。Provide a meaningful name for your policy. [除外] タブで [ユーザーとグループ] のボックスをオンにして、緊急アクセス用アカウントを選択します。On the Exclude tab, check the box for Users and groups and choose your emergency access accounts. [クラウド アプリ] で、[すべてのクラウド アプリ] ラジオ ボタンを選択します。Under Cloud apps, select the All cloud apps radio button. オプション:[Exclude](除外) タブで、組織において MFA の必要がないクラウド アプリを選択します。OPTIONALLY: On the Exclude tab, choose cloud apps that your organization does not require MFA for. オプション:Azure Identity Protection を有効にしてある場合は、ポリシーの一部としてサインイン リスクを評価することを選択できます。OPTIONALLY: If you have enabled Azure Identity Protection, you can choose to evaluate sign-in risk as part of the policy. オプション:信頼できる場所または名前付きの場所を構成してある場合は、これらの場所をポリシーに追加するか、ポリシーから除外するよう指定できます。OPTIONALLY: If you have configured trusted locations or named locations, you can specify to include or exclude those locations from the policy. [許可] で、[アクセス権の付与] ラジオ ボタンが選択されていることを確認します。Under Grant, make sure the Grant access radio button is selected. [多要素認証を要求する] のボックスをオンにします。Check the box for Require multi-factor authentication. [セッション] セクションはスキップしますSkip the Session section. [ポリシーを有効にする] トグルを [オン] に設定します。Set the Enable policy toggle to On. 従来のオンプレミス アプリケーションでは、アプリケーション プロキシを使用する必要があります。Legacy on-premises applications, which will need to use Application proxy. オンプレミスの RADIUS アプリケーションでは、MFA アダプターと NPS サーバーを使用する必要があります。On-premises RADIUS applications, which will need to use MFA adapter with NPS server. オンプレミスの AD FS アプリケーションでは、MFA アダプターと AD FS 2016 を使用する必要があります。On-premises AD FS applications, which will need to use MFA adapter with AD FS 2016. Azure AD でに対して直接認証を行い、先進認証 (WS-Fed、SAML、OAuth、OpenID Connect) を使用するアプリケーションでは、条件付きアクセス ポリシーを直接使用することができます。Applications that authenticate directly with Azure AD and have modern authentication (WS-Fed, SAML, OAuth, OpenID Connect) can make use of conditional access policies directly. オンプレミスに存在するアプリケーションは、Azure AD アプリケーション プロキシを使用して Azure AD テナントに公開でき、Azure AD の事前認証を使用するように構成されている場合は、Azure Multi-Factor Authentication を利用できます。Applications residing on-premises can be published to your Azure AD tenant via Azure AD Application Proxy and can take advantage of Azure Multi-Factor Authentication if they are configured to use Azure AD pre-authentication. これらのアプリケーションは、他の Azure AD に統合されたアプリケーションと同様、Azure Multi-Factor Authentication を適用する条件付きアクセス ポリシーの対象になります。These applications are subject to conditional access policies that enforce Azure Multi-Factor Authentication, just like any other Azure AD-integrated application. 同様に、すべてのユーザー サインインに対して Azure Multi-Factor Authentication が強制されている場合は、Azure AD アプリケーション プロキシで公開されたオンプレミスのアプリケーションは保護されます。Likewise, if Azure Multi-Factor Authentication is enforced for all user sign-ins, on-premises applications published with Azure AD Application Proxy will be protected. CHAPv2 プロトコルでは、認証アプリのプッシュ通知と音声通話のみがサポートされます。With the CHAPv2 protocol, only authenticator app push notifications and voice call are supported. 条件付きアクセス ポリシーは適用できません。Conditional access policies cannot be applied. NPS 拡張機能は、RADIUS とクラウドベースの Azure MFA の間のアダプターとして機能し、VPN、リモート デスクトップ ゲートウェイ接続、またはその他の RADIUS 対応アプリケーションを保護するための、第 2 の認証要素を提供します。The NPS extension acts as an adapter between RADIUS and cloud-based Azure MFA to provide a second factor of authentication to protect VPN, Remote Desktop Gateway connections, or other RADIUS capable applications. この環境の Azure MFA に登録したユーザーは、すべての認証の試行に対してチャレンジされ、条件付きアクセス ポリシーがないため常に MFA が要求されます。Users that register for Azure MFA in this environment will be challenged for all authentication attempts, the lack of conditional access policies mean MFA is always required. 既に NPS インスタンスがデプロイされて使用されている場合は、「Azure Multi-Factor Authentication と既存の NPS インフラストラクチャの統合」をご覧ください。If you have an NPS instance deployed and in use already, reference Integrate your existing NPS Infrastructure with Azure Multi-Factor Authentication. NPS を初めて設定する場合は、「ネットワーク ポリシー サーバー (NPS)」の手順をご覧ください。If you are setting up NPS for the first time, refer to Network Policy Server (NPS) for instructions. トラブルシューティングのガイダンスについては、「Azure Multi-Factor Authentication の NPS 拡張機能からのエラー メッセージを解決する」をご覧ください。Troubleshooting guidance can be found in the article Resolve error messages from the NPS extension for Azure Multi-Factor Authentication. MFA に登録されていないユーザーが認証を試みたときの処理を選択します。Choose what happens when users that aren’t enrolled with MFA try to authenticate. レジストリ パス HKLM\Software\Microsoft\AzureMFA のレジストリ設定 REQUIRE_USER_MATCH を使用して、機能の動作を制御します。Use the registry setting REQUIRE_USER_MATCH in the registry path HKLM\Software\Microsoft\AzureMFA to control the feature behavior. この設定の構成オプションは 1 つだけです。This setting has a single configuration option. この設定により、MFA に登録されていないユーザーの扱いが決まります。The purpose of this setting is to determine what to do when a user is not enrolled for MFA. この設定を変更したときの効果を、次の表に示します。The effects of changing this setting are listed in the table below. 組織が Azure AD とフェデレーションされている場合は、オンプレミスとクラウドの両方で、Azure Multi-Factor Authentication を使用して AD FS リソースをセキュリティ保護することができます。If your organization is federated with Azure AD, you can use Azure Multi-Factor Authentication to secure AD FS resources, both on-premises and in the cloud. Azure MFA を使用すると、パスワードを減らし、より安全な認証方法を提供できます。Azure MFA enables you to reduce passwords and provide a more secure way to authenticate. Windows Server 2016 以降、プライマリ認証用に Azure MFA を構成できるようになりました。Starting with Windows Server 2016, you can now configure Azure MFA for primary authentication. Windows Server 2012 R2 での AD FS とは異なり、AD FS 2016 の Azure MFA アダプターは Azure AD と直接統合されるので、オンプレミスの Azure MFA サーバーは必要ありません。Unlike with AD FS in Windows Server 2012 R2, the AD FS 2016 Azure MFA adapter integrates directly with Azure AD and does not require an on-premises Azure MFA server. Azure MFA アダプターは Windows Server 2016 に組み込まれており、追加のインストールは必要ありません。The Azure MFA adapter is built into Windows Server 2016, and there is no need for an additional installation. アプリケーションが Azure AD の証明書利用者で、AD FS 2016 とフェデレーションされている場合、条件付きアクセスを使用できます。Conditional access is available when the application is a relying party to Azure AD, federated with AD FS 2016. アプリケーションが AD FS 2016 の証明書利用者で、AD FS 2016 で管理またはフェデレーションされている場合、条件付きアクセスは使用できません。Conditional access is not available when the application is a relying party to AD FS 2016 and is managed or federated with AD FS 2016. AD FS 2016 がプライマリ認証方法として Azure MFA を使用するように構成されている場合も、条件付きアクセスを使用できません。Conditional access is also not available when AD FS 2016 is configured to use Azure MFA as the primary authentication method. 各 AD FS サーバーでは、ローカル コンピューターの My ストアに、OU=Microsoft AD FS Azure MFA というタイトルの自己署名された Azure MFA 証明書があり、証明書の有効期限の日付が含まれます。On each AD FS server, in the local computer My Store, there will be a self-signed Azure MFA certificate titled OU=Microsoft AD FS Azure MFA, which contains the certificate expiration date. 有効期限を確認するには、各 AD FS サーバーでこの証明書の有効期間を調べます。Check the validity period of this certificate on each AD FS server to determine the expiration date. 証明書の有効期限が近づいている場合は、各 AD FS サーバーで新しい MFA 証明書を生成して検証します。If the validity period of your certificates is nearing expiration, generate and verify a new MFA certificate on each AD FS server. 次のガイダンスでは、AD FS サーバー上の Azure MFA 証明書を管理する方法について詳しく説明します。The following guidance details how to manage the Azure MFA certificates on your AD FS servers. Azure MFA で AD FS を構成するとき、New-AdfsAzureMfaTenantCertificate PowerShell コマンドレットで生成される証明書の有効期間は 2 年です。When you configure AD FS with Azure MFA, the certificates generated via the New-AdfsAzureMfaTenantCertificate PowerShell cmdlet are valid for 2 years. MFA サービスが中断するのを防ぐため、期限が切れる前に証明書を更新してインストールします。Renew and install the renewed certificates prior to expiration to ovoid disruptions in MFA service. MFA のロールアウトを開始するグループを選択します。Select groups to begin rolling out MFA. Azure MFA での一般的な問題の解決策については、Microsoft サポート センターで Azure Multi-Factor Authentication のトラブルシューティングに関する記事を検索してください。Find solutions for common issues with Azure MFA at the Troubleshooting Azure Multi-Factor Authentication article on the Microsoft Support Center. MFA を実行する際にユーザーにプロンプトが表示される場合と表示されない場合については、Why was a user prompted or not prompted to perform MFA? Azure Multi-Factor Authentication のレポートに関するドキュメントの Azure AD サインイン レポートのセクションを参照してください。See the section Azure AD sign-ins report in the Reports in Azure Multi-Factor Authentication document.